When you take the imperial cashew and cover it with rich, superbly delicious dark chocolate you have an ultimately elegant treat. The intense dark chocolate is the perfect complement to the naturally soft texture and mildly sweet, buttery flavor of the cashews. 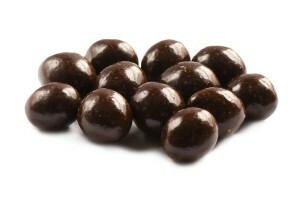 Dark chocolate covered cashews add elegance to a party table and are an impressive gift idea. Dark Chocolate (Sugar, Chocolate Liquor, Cocoa Butter, Anhydrous Milk Fat, Soy Lecithin (An Emulsifier) And Vanilla) Cashews, Gum Arabic, Corn Syrup, Sugar and Certified Confectioners Glaze. Cashews are a Product of Vietnam, India or Brazil. At least half of my bag was very soft. Not much crunch at all. PLEASE bring back the dark chocolate hazelnuts!! Those are great!! Sadly the price has went up from $5 something to $7 something since I ordered these but these are delicious. (And the prices on Nutstop are so low anyway.) The dark chocolate is healthy, right? If anything, there is so much delicious chocolate that it kind of makes it seem you aren’t eating the cashews at all. I love dark chocolate and the cashews make it a bit healthier. These cashews are the best that I have had! The dark chocolate is thick and so silky. I’m buying more! 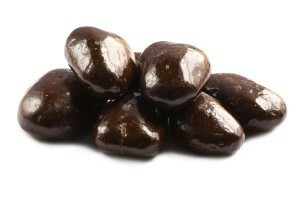 The Dark Chocolate Covered Cashews arrived quickly and were very fresh. Wonderful to have on hand for holidays and special occasions. Recommend. My only complaint is I can’t stop eating them!!!!!! Fantastic! The cashews and dark chocolate are an amazingly yummy combination! These cashews are amazing! I love them and will definitely purchase again! Wow these are wonderful and great tasting, I bought multiple because they are so delicious. These are addicting and delicious! I normally purchase the Ghiradelli brand but these are just as good in quality and taste, and the price is unbeatable. You will not be able to seal up the bag until you have “just one more” before doing so. This product is a winner! These are coated with a thick layer of chocolate. They taste good. I so wish these were better for you! Amazingly good! Like potato chips, you simply cannot eat just one. I’d already have ordered more but I’m trying to pace myself! Great dark chocolate and plenty of it. These are soooo good. Thank you for the fast service. Delicious dark chocolate cashews, fair pricing, and fast shipping! Need I say more? Awsome!!!! The best thing I have ever eaten.